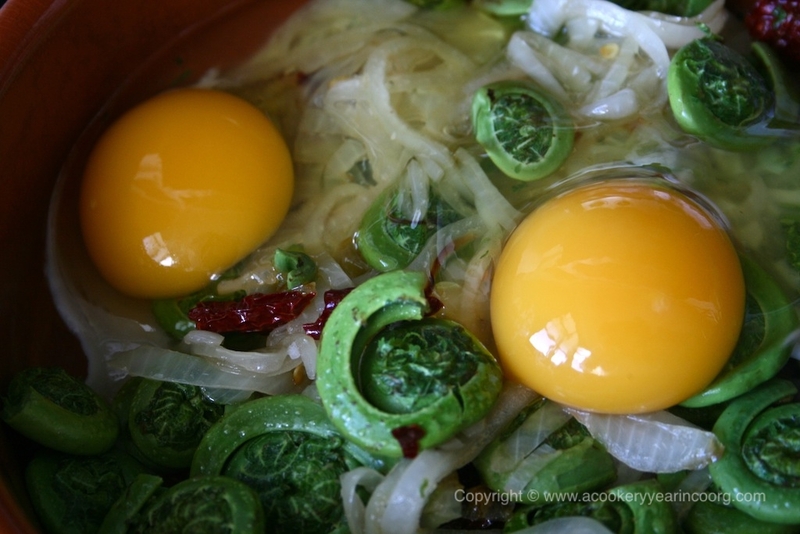 This recipe from my friend Latha, combines thermé shoots (edible bracken ferns) with eggs in a tasty scramble. Pick over the thermé shoots and discard any that are not tender enough to snap easily. Wash thoroughly in plenty of cold water. Break (don’t chop) the fronds into pieces about 4″ long. You may blanch them if you wish. Heat the oil in a pan and fry the onions for a couple of minutes, then add the red chillis. Cook for a minute, then add the thermé. Stir to mix and fry uncovered till the greens start to wilt.The volume will reduce considerably, so do not add salt until the thermé seems tender and down to about 1/4 its original volume – in approximately 12-15 minutes. Break in the eggs and stir gently to coat the greens. It’s ready when the eggs are set to your liking. If you’re using coconut instead, add it now and cook for another minute before removing. Finish with a squeeze of citron or lemon juice.